We became very well acquainted with our slow cooker during my campaign. A love-hate relationship developed. When a dish worked, it was wonderful. But there were many days when I threw in a whole lot of string spices only to end up with flavorless meat. I was so confused and disturbed. But, we studied the dishes that went well and those that went awry and we learned a lot. Key #1 (and the focus of why this dish worked well) – ratio of spices to liquid. More spice & herbs, less liquid. 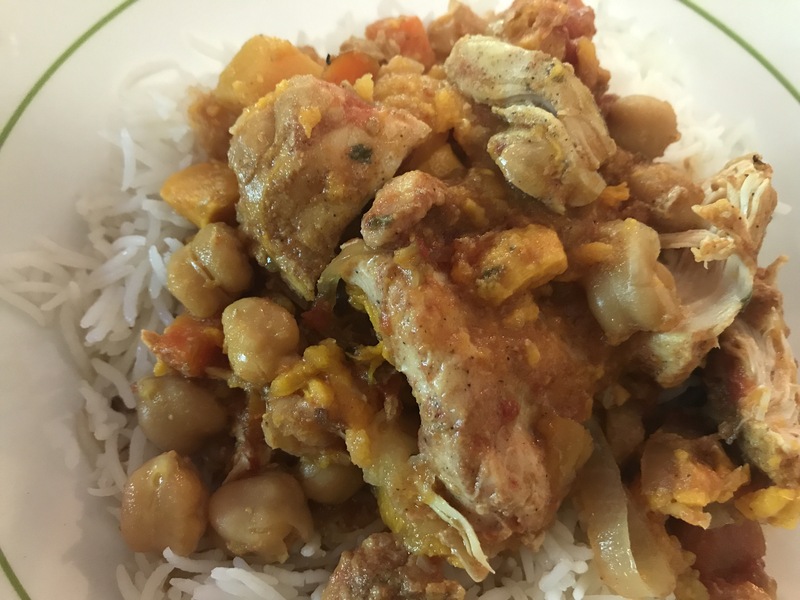 This dish filled both our house with wonderful smells and our mouths with great flavors. 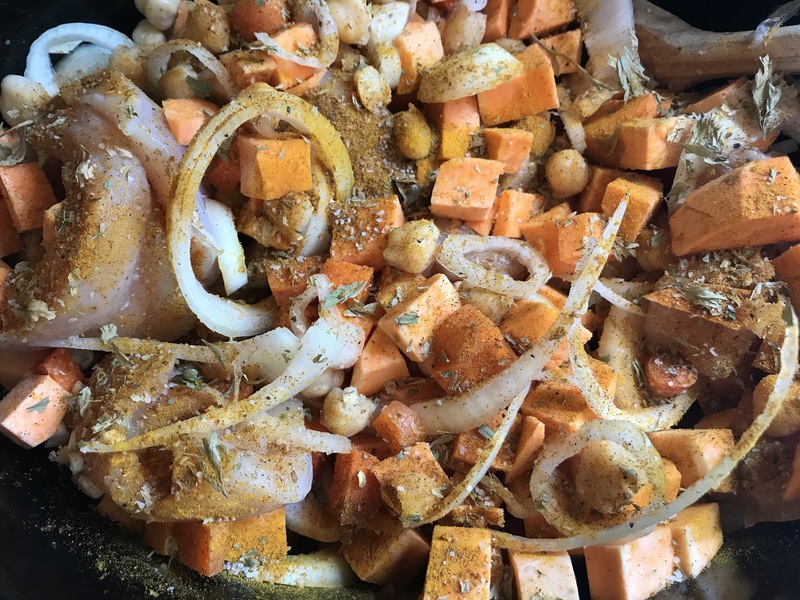 Place the onion, garlic, carrots, sweet potatoes, garbanzo beans, and chicken breast pieces into a slow cooker. In a bowl, mix the cumin, turmeric, cinnamon, black pepper, parsley, and salt, and sprinkle over the chicken and vegetables. Pour in the tomatoes, and stir to combine. Cover the cooker, set to High, and cook until the sweet potatoes are tender and the sauce has thickened, 4 to 5 hours. Serve over rice and enjoy! Can you believe I STILL have sweet potatoes from my garden?! Whether it really was a good harvest or just the fact that I took 8 weeks off from cooking during my campaign, I am not sure. But here is what part of the harvest looked like. 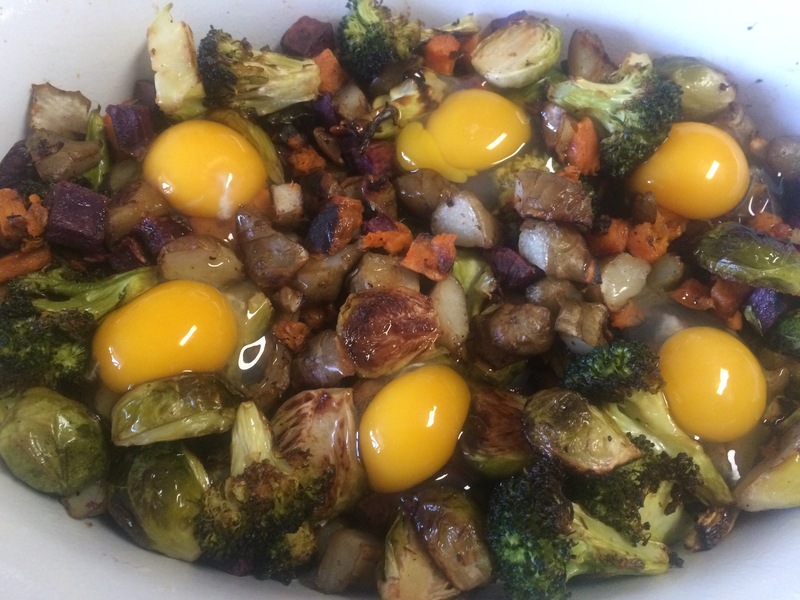 We got some nice brussels sprouts this week, so I decided to make a roasted veggie and egg dish inspired by Ree Drummand’s Beautiful Brussels Sprouts. 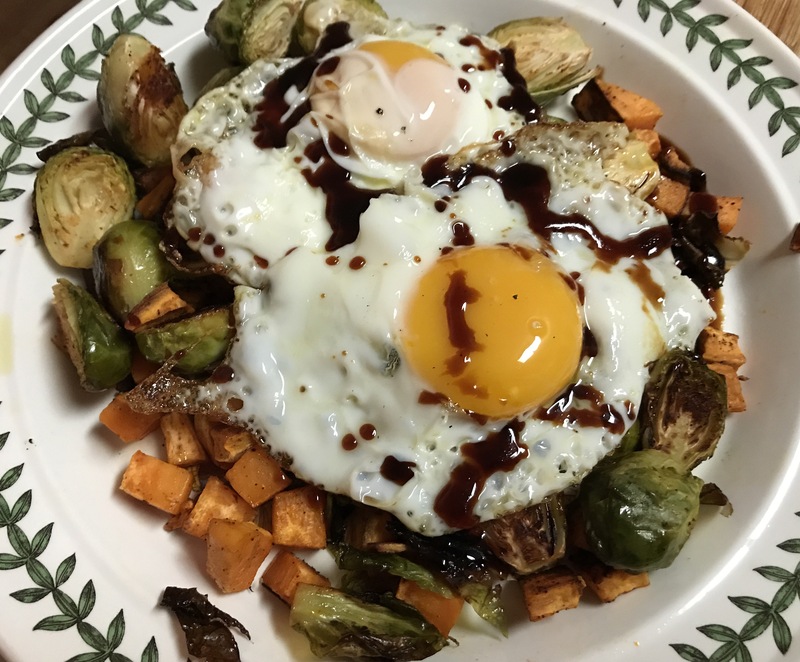 Roasted vegetables with olive oil fried eggs is probably the favorite comfort food in our house. Adding the pomegranate molasses and chili powder added some new and interesting flavors. I ended up liking it more and more with each bite. Don’t go too heavy on the pomegranate molasses, all it needs is a drizzling. And then….happiness in our mouths and bellies! 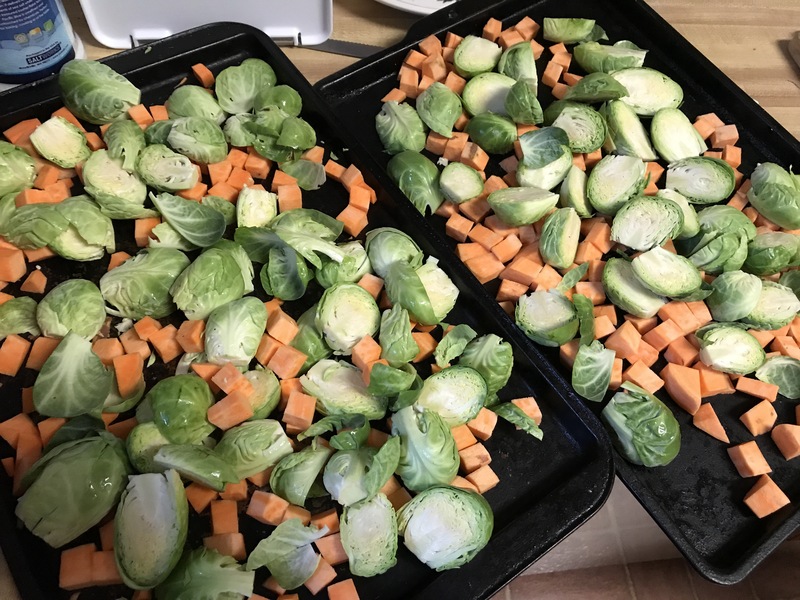 Divide the sweet potatoes and Brussels sprouts between 2 baking sheets. Drizzle 2 – 3 Tbsp olive oil on the vegetables, sprinkle with chili powder (heavier if you want more kick, lighter if you want just a touch of heat), salt and pepper. Toss to thoroughly coat the vegetables. Place in the oven a roast for 15 minutes. Stir the vegetables and roast for another 15 – 20 minutes. In the last few minutes that the vegetables are roasting, heat 2 Tbsp olive oil in a large skillet (I prefer cast iron) over medium-high heat. Fry the eggs, spooning oil over the yolk for a few minutes til cooked to your preference. 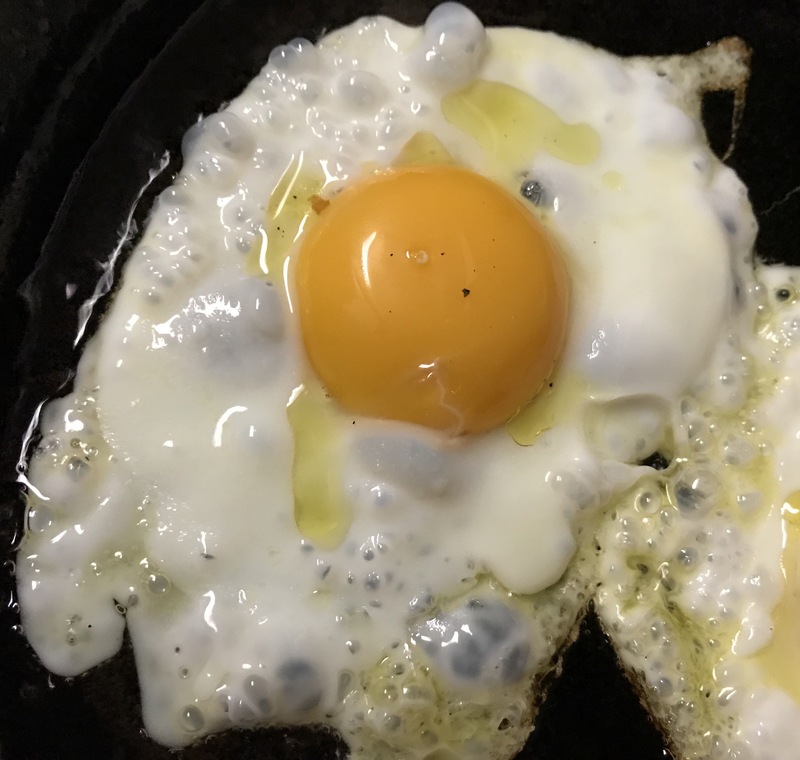 You will likely need to fry the eggs in batches. Divide the vegetables among 4 plates and top each with 2 eggs. Drizzle the pomegranate molasses over the top. Serve immediately and enjoy! I still have PLENTY of sweet potatoes from our garden, about 1/2 a milk crate left (somehow I still have the crates we used to use when I grew up in NY in the 60’s and we still got milk deliveries). The crates are perfect for storing the sweet potatoes. Our last CSA box included red russian kale. 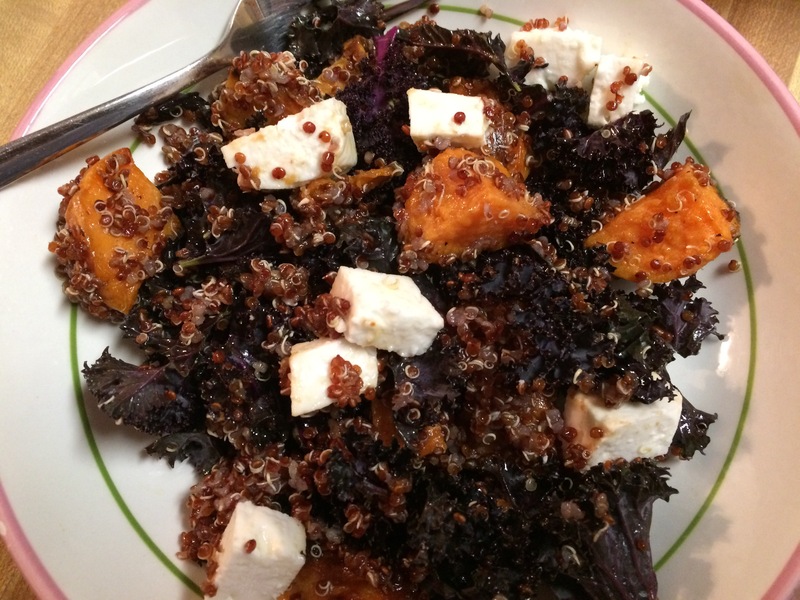 Combined with the sweet potatoes, quinoa and some feta – we had a great dinner! Healthy and light, yet really satisfying! Preheat oven to 425 degrees F and cover a baking sheet with aluminum foil. Place the sweet potatoes in a bowl and toss with 2 Tbsp olive oil, salt and pepper. Arrange sweet potatoes in a single layer on the baking sheet. Roast until golden and tender, about 30 minutes, stirring after 15 minutes. Meanwhile, combine quinoa and 2 cups of water in a medium saucepan and bring to a boil. Reduce heat to low and simmer, covered, 15 minutes. Remove from heat and let sit, covered, 5 minutes more. Let cool slightly. In a large bowl, combine quinoa, sweet potatoes, and kale. In a small bowl, whisk together balsamic vinegar and the remaining 3 tablespoons olive oil. Drizzle vinaigrette over salad, tossing gently to combine. Season with salt and pepper. Stir in the feta just before serving. Enjoy! I had spent days and days baking cookies and cakes for Hanukkah. I thought I was finally finished baking. I went through 10 lbs of flour in just a few days! I put away my baking mat and pushed the standing mixer back into the corner. I was done. sweet potatoes from my garden and spinach from the CSA! Yes, vegetarian empanadas. The filling was delicious, just the right amount of smokiness from the adobo sauce. 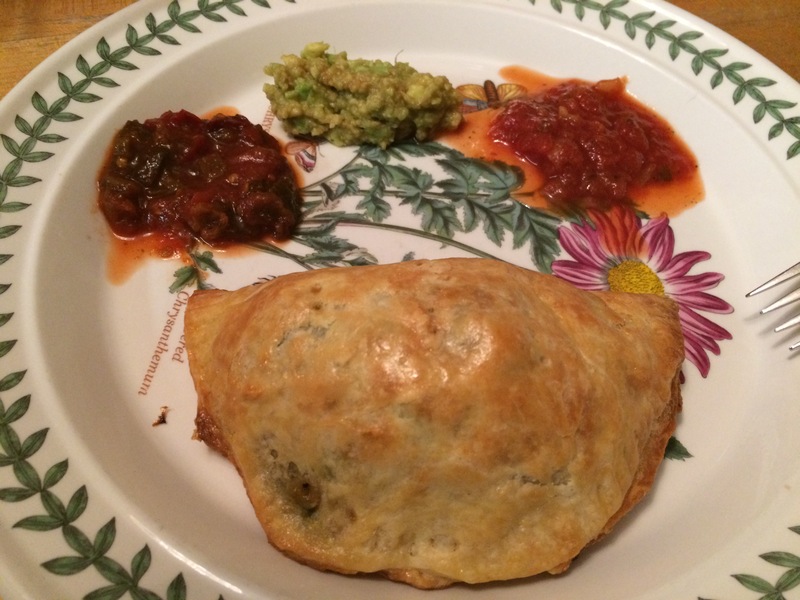 Thank goodness the recipe made extra – we munched on the filling by itself as the empanadas baked. The pastry was one of the best I have ever made. It was super buttery and flaky. I served it with some home-made guacamole, chipotle salsa and mild salsa. Whisk together the flour and salt for the crust. Cut in the cold butter using a pastry cutter, working until the butter is about the size of peas and well mixed with the flour. In a separate bowl, whisk the egg. Stir in the ice water and vinegar. Gently mix the liquid with the flour, using a fork in a fluffing motion. When all of the liquid has been mixed in and the dough is in large clumps, turn it out onto a clean work surface. Knead 5–6 times, or until all of the shaggy bits of flour have been absorbed into the dough. Shape the dough into a 1″ thick rectangle and wrap tightly with plastic wrap. Chill at least 1 hour. In a large skillet over medium heat, heat the oil. Add the shallot and cook for 2 minutes, stirring regularly. Add the garlic and continue to cook until the shallot is translucent and barely beginning to brown. Stir in the cumin, coriander, adobo, and salt. Stir in the spinach and let it wilt for 1 minute. 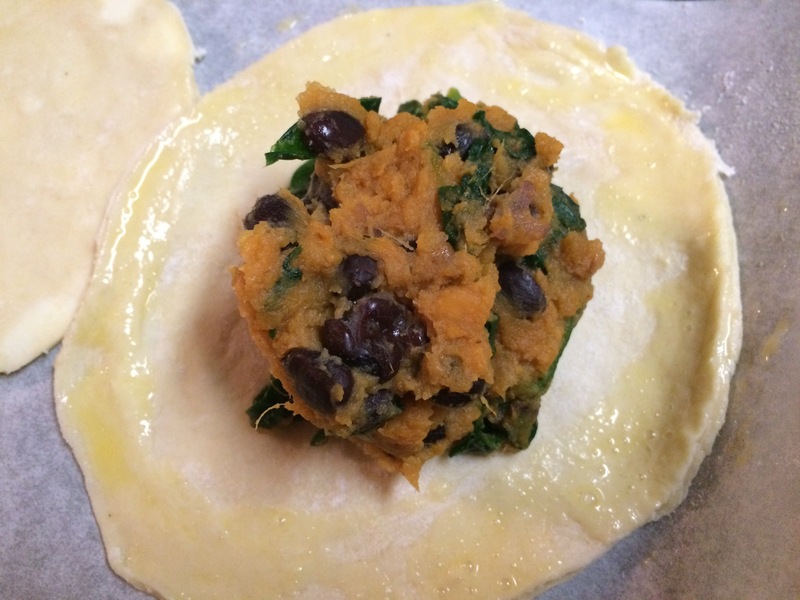 Add the black beans and sweet potato mash and stir until all of the ingredients are thoroughly mixed together. Remove the filling from the heat and let it cool while rolling out the crust dough. Remove the dough from the fridge and place it on a floured work surface. Roll it out to about ¼″ thickness. Use a 6″ round cutter or trace a bowl to cut 6″ circles. Re-roll the dough as needed to incorporate the scraps. Aim for 7–8 dough circles. Transfer the crust rounds to a lined baking sheet. Brush the edges with egg wash.
Drop about ⅓ cup of the filling in the center of each circle. There may be a little filling left over, but do not give in to the temptation to over-fill the empanadas, or they will be unable to close. Fold the dough circle in half over the filling to form a filled semicircle. Press the edges together with a fork and prick the top of each empanada 3 times to create vents. Brush the tops of the empanadas thoroughly with egg wash.
Bake for 25–30 minutes, or until the crust is golden brown and baked through. Allow to cool 5 minutes before serving. Serve with guacamole, sour cream, or garlicky salsa for dipping. Enjoy! 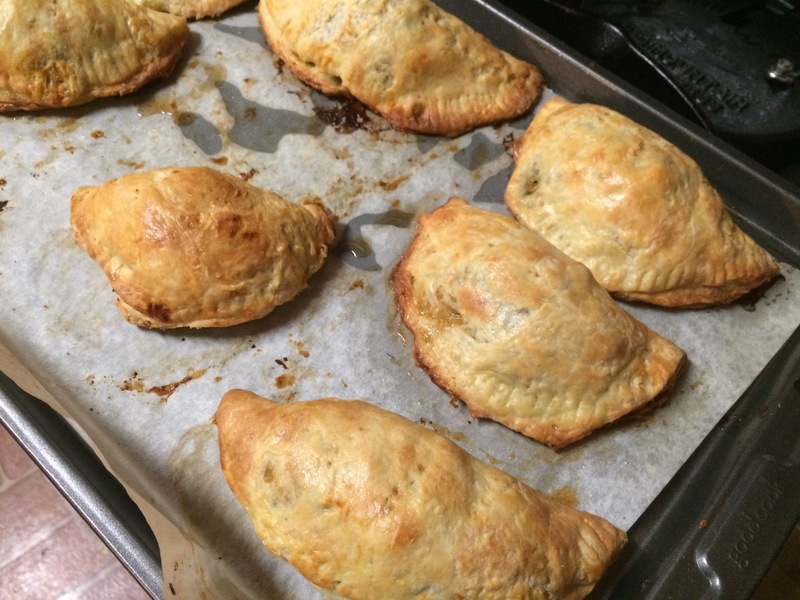 Makes 7 – 8 empanadas, serves 6 – 8. We had a bountiful sweet potato harvest this year. Not only are they plentiful, they are huge! So I guess you will be seeing a bunch of sweet potato posts this fall and winter. 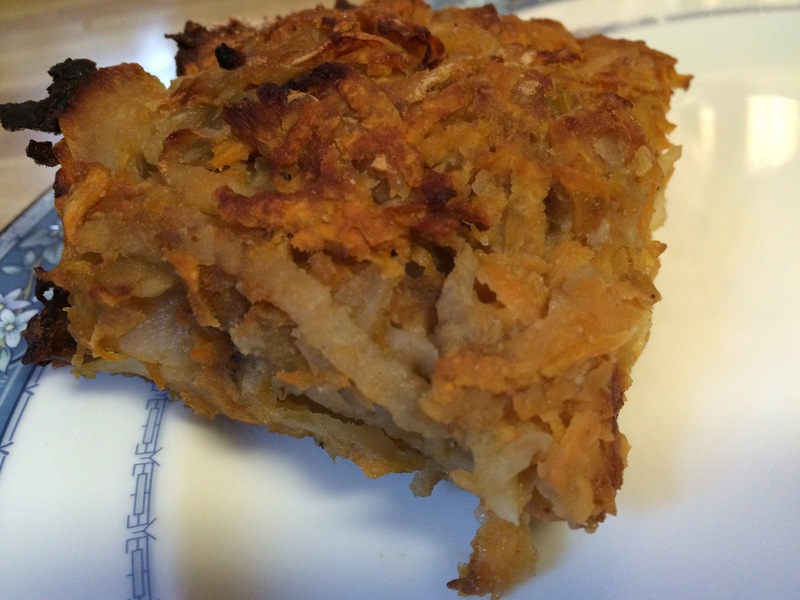 To start off with, I made a sweet potato kugel for Rosh Hashanah. I loved the flavor, but the cayenne pepper was a bit much for my 7 year old, so you can, and probably should, omit that if you make this for children. But the cayenne really did give it a nice kick! 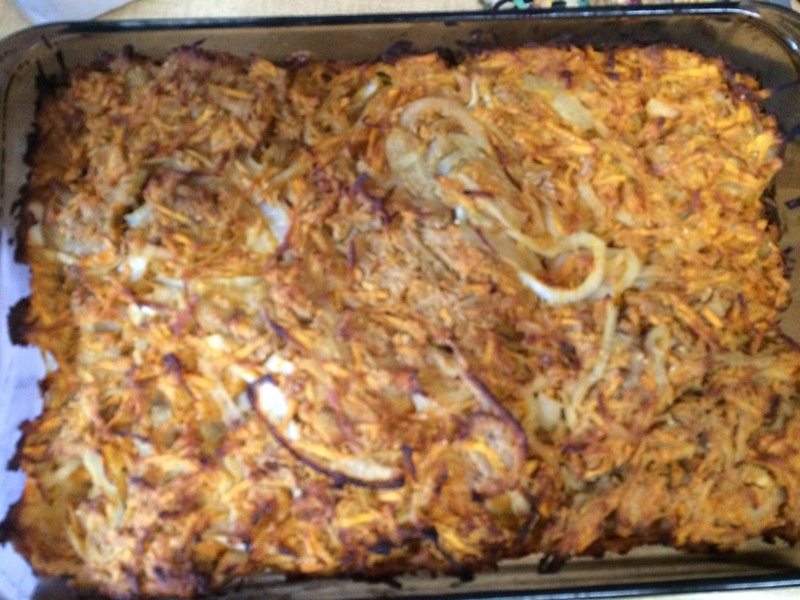 The kugel called for 2 pounds of sweet potatoes. Here they are. As you can see, this didn’t even make a dent in my supply, and we will be eating the kugel for days. Man, the sweet potatoes really are going to last through the winter. Heat 3 Tbsp of the oil in a large skillet over medium-low heat. 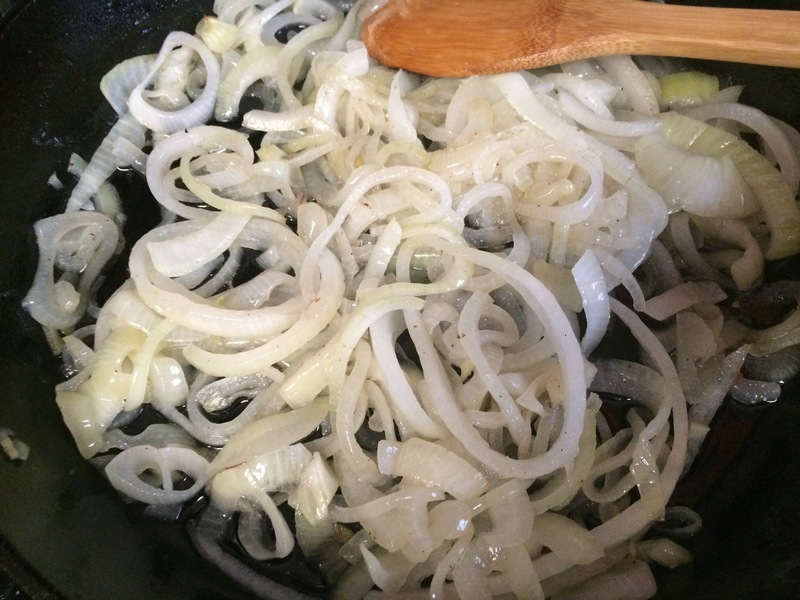 Add the onions and cook, stirring often, until soft and lightly colored. Remove from the heat and set aside. Preheat the oven to 400F. Lightly grease a 9×13 baking dish. Grate the sweet potatoes and russet potatoes. Place in a large bowl. Add the rest of the oil, the onions, eggs, honey, matzoh meal, cayenne, cumin and salt. Stir to combine. Pour the mixture into the prepared dish and smooth the top. Bake until the kugel is well browned on top, about an hour. Cool for 10 minutes to make it easier to cut. Serve warm. And then bake together with some eggs in order to provide us with a delicious meal. Topped with egg or baked as we did tonight. 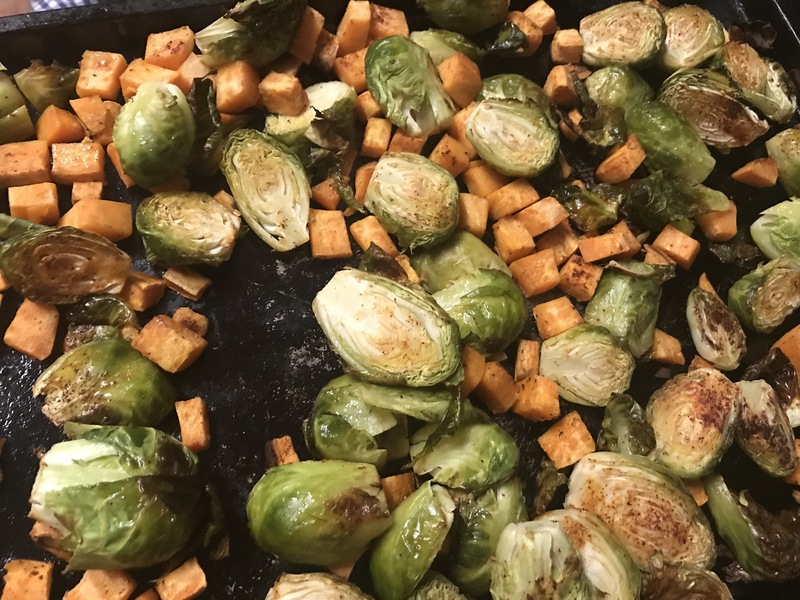 The key to roasting vegetables is to cook vegetables with similar cooking times together. So here we grouped the root vegetables and the cole crops on separate baking sheets. THe other key is to only have a single layer of vegetables, don’t overload the baking sheets. 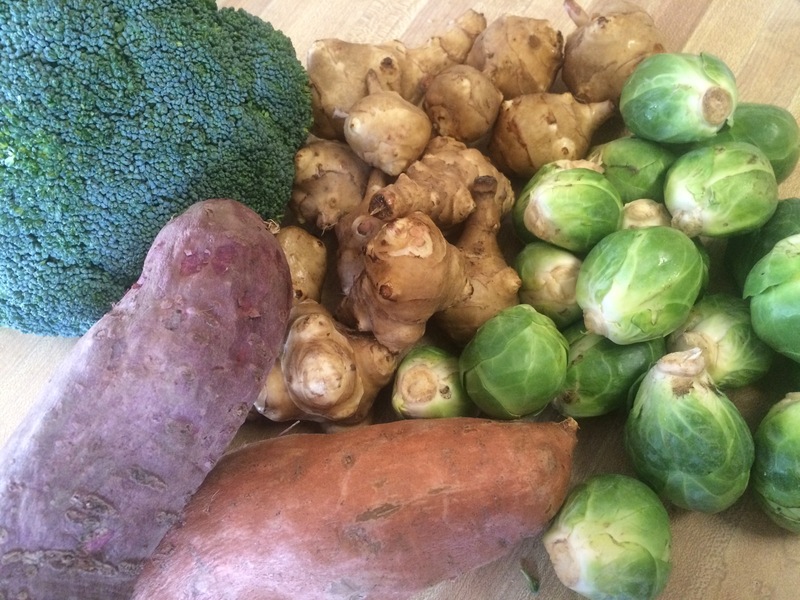 Chop the Jerusalem artichokes and sweet potatoes into 1/2 – 3/4 inch pieces. Toss with 1 Tbsp oil, salt and pepper. Spread on a baking sheet in a single layer and cook until the outside is crisp and the inside is tender, tossing every 15 minutes (about 45 minutes). Meanwhile, trim and halve the Brussels sprouts and cut the broccoli into small heads and cut the stem into 3/4 inch pieces. Spread in a single layer on a baking sheet. Add to the oven and cook until crisp and cooked through, also in 15 minute intervals (about 30 minutes). Reduce the oven to 350F. 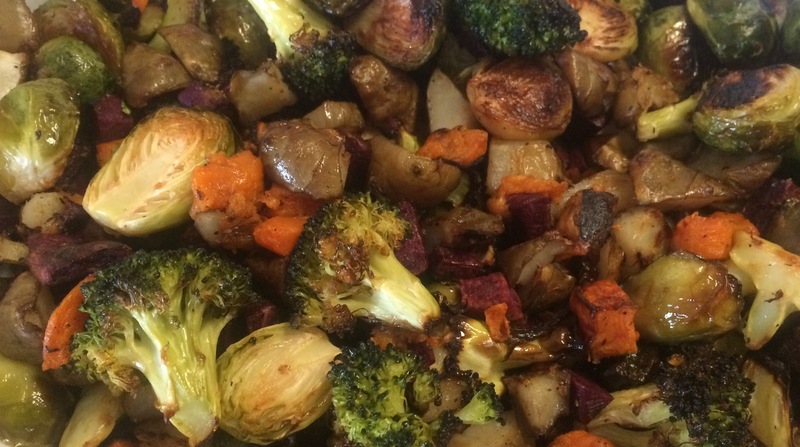 Mix all the roasted vegetables in a large casserole dish. Make 6 slight indentations in the vegetables and crack an egg into each indent. Bake until the eggs are cooked through, time for this will vary between 7 minutes and 30 minutes, so you have to keep a watch on them. Serve and enjoy! Finally, a kale salad that is definitely worth writing home about! I will be honest, I had low expectations of this, but it was great, really fun and enjoyable to eat. I think there were 2 key points, how well massaged the kale was and the crunch of the tortilla chips. The big surprise was how well the avocado and sweet potato went together. Toss sweet potato with 1 tablespoon of taco seasoning and 1 tablespoon olive oil. Spread on a baking sheet in an even layer and bake for 25-35 minutes, stirring occasionally until softened. Meanwhile, in a large bowl, toss kale with remaining olive oil and taco seasoning. Massage for 3-5 minutes until kale begins to soften. Toss black beans and onions with seasoned massaged kale. 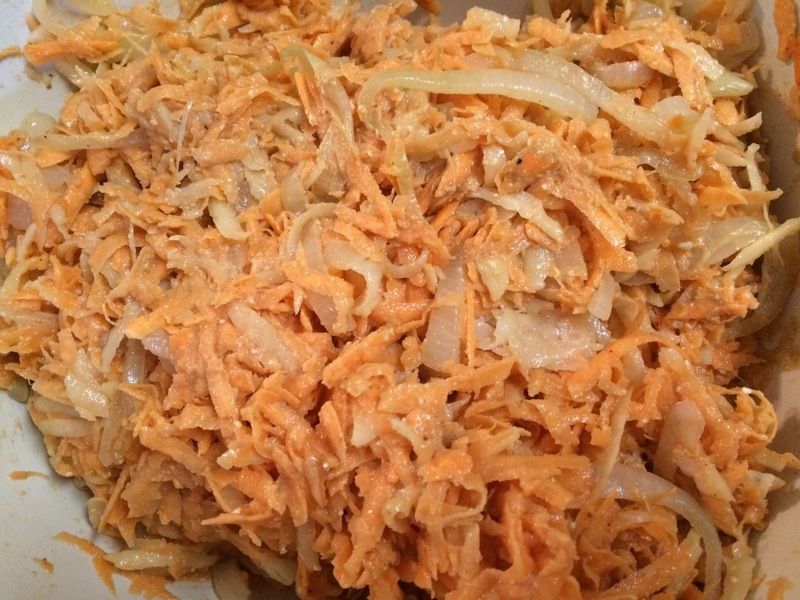 Mix with avocado warm sweet potato, shredded cheese. Serve with tortilla chips and salsa. Enjoy!